exporting some electricity to the grid. equal value to heat. The truth is, electricity is more valuable than heat. Figure 21.8. 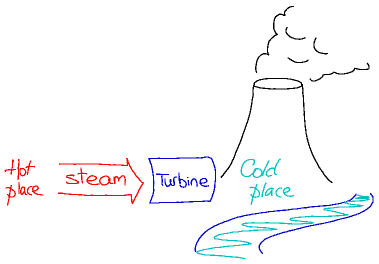 How a power station works. There has to be a cold place to condense the steam to make the turbine go round. The cold place is usually a cooling tower or river. Figure 21.9. Combined heat and power. District heating absorbs heat that would have been chucked up a cooling tower.